The guys at Phoenix Labs sent me back home with some extra keys for the closed Beta. If you’d like one, leave a comment below and we’ll pick 5 readers who’ll get keys for Dauntless. In any other game, a group of newbie adventurers would find themselves going up against nothing more notable than a particularly vicious fetch quest. Dauntless isn’t any other game. Here the monsters are massive and the combat’s intense right from the start. There’s a reason I had jokingly referred to it as ‘Boss Battles: The Game’ before stepping up to play the PAX South demo. 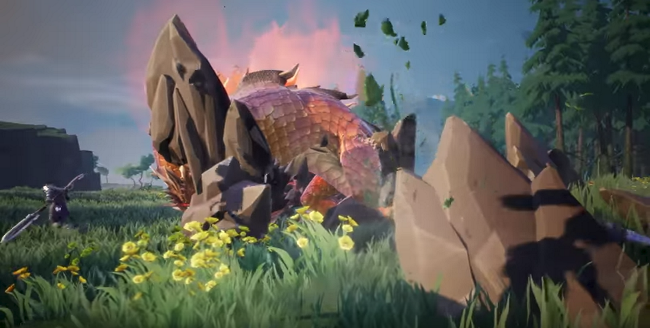 Currently, that reason was one of the game’s new behemoths, a massive rock-plated monster named Skarn. 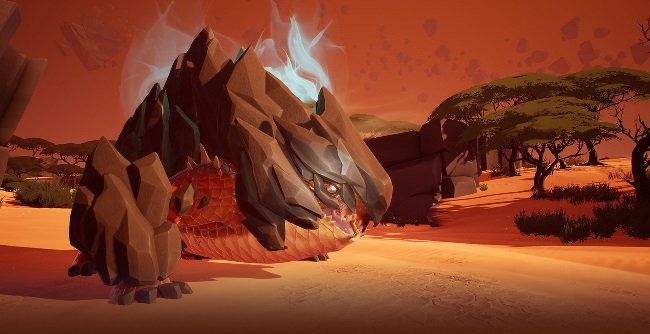 When the team at Phoenix Labs set out to create Dauntless, their co-op action RPG, one of their main goals was to bypass the usual boring grind and get players right into the thick of things. To that end, players don’t waste time collecting ‘x’ frog teeth for random NPCs as they slowly level up. Instead they dive right into epic encounters against the massive enemies found amid the Shattered Isles. The team loads in on Skarn’s island and we set out to find him. Joining me on the hunt was the game’s combat designer, Chris Fox. I was more than happy to let him take point as we spread out to search for our quarry. I’d opted for the new war pike which wasn’t as effective against Skarn’s armor as the hammer Fox was wielding. Once Skarn is spotted, a flare goes up and we rush to his location. At first I’m not seeing anything except some glowing rock fissures. Before I can ask what happens next the ground rips apart and Skarn emerges. Dwarfed by the lumbering rock lizard ahead of us, the party’s natural response was to all rush in and began swinging our weapons wildly. Skarn was unimpressed and proceeded to roll over us, inflicting massive damage with his boulder plates. Like any formidable boss fight, success in Dauntless requires teamwork and the proper strategy. Every behemoth has its own strengths and weaknesses which players must work together to identify and exploit. Even more important is the ability to spot a creature’s unique attack tells so you can evade their most powerful hits. “Watch out, he’s gonna spin,” Fox warned. Frantic dodge rolls ensued, but it was already too late. Skarn’s spin attack creates a swirling vortex that pulls you right into his damage zone. Later, Fox would tell me that this initial failure is part of the game’s learning curve. The first encounter with a behemoth will rarely be successful. Luckily, the game’s community is willing to put in the work necessary to make their slayers worthy of such legendary battles. 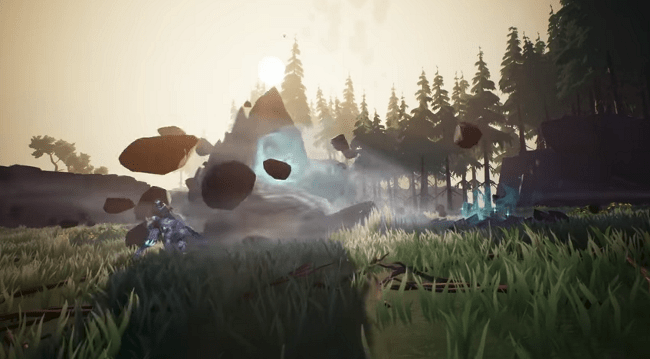 Dauntless is currently in closed beta. Phoenix Labs plans to move to open beta sometime in late Spring or early Summer with sign-ups available through their website. The game will be free-to-play at launch and feature cosmetic microtransactions for additional character customization.